paid for the ticket on my own! Mamma Mia- a music comedy movie with the songs from ABBA. 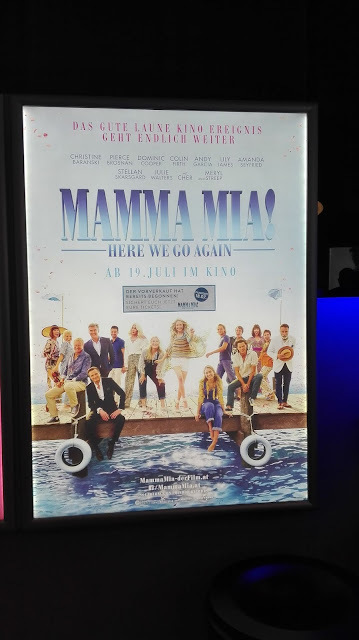 The first part entered the cinemas in 2008 and this summer (10 years after the first part) finally a second part, named "Mamma Mia- Here we go again" is airing in cinemas worldwide. The movie takes part 5 years after the first movie (so Sophie is now 25 years old). 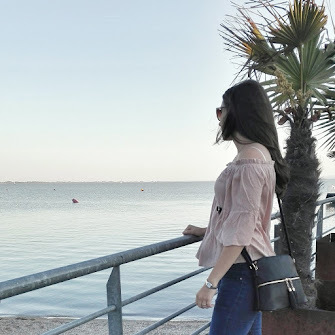 Sophie wants to continue with the hotel that her mum Donna built up and that´s why she wants to do a big re-opening, for which she invites the best friends of Donna and two of her (possible) dads and many other guests. The problem is that her husband Sky is living in New York where he gets a great job offer and he isn´t sure if he should agree to that job offer. Meanwhile a big storm destroys all of the preparations for the re-opening. Parallel to that story the movie shows Donna´s story - what she did after graduation, how she met Sophie´s possible dads and why she stayed at this greek island. After some time Sophie discovers that she is pregnant and can relate more and more to the story of her mum. I REALLY liked the movie (so much that I watched it twice in the cinema!). All of the actors from the first movie are also part of the second movie, which I totally like. The songs are again real catchy records, that I could listen to over and over again. Compared to the first movie it is a little bit sadder and more thoughtful I think, but that doesn´t make the movie any worse ! It is not only a good mood movie, but you can totally relate to everyone´s feelings and should definitly take tissues with you to the cinema. But don´t get me wrong, there are also many funny moments - so it´s a movie filled with a great mixture of different emotions. It´s a rousing and thrilling movie that I can recommend to everyone. It already is one if my favourite movies now. Have you already seen the movie "Mamma Mia- Here we go again" `? If yes, did you like it? If not, are you planning to watch it?